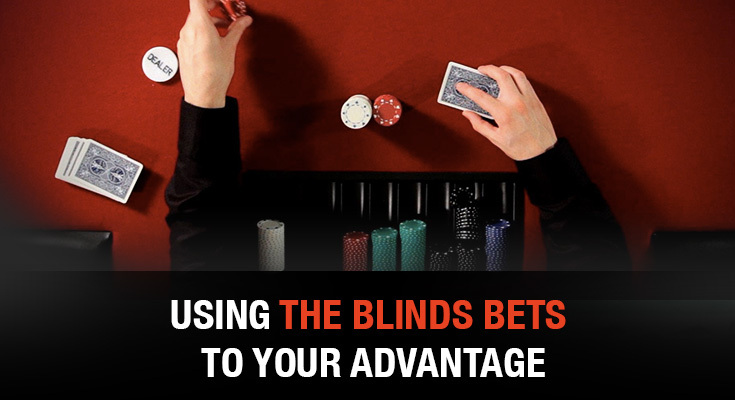 In cash games, stealing blinds should be an important part of your strategy. In this section we’ll talk more about how to steal blinds – and what to do if someone’s stealing them from you. Cash games are all about action. Usually, it’s the most aggressive players who win the money, either by forcing people with marginal hands to fold, or hoping their aggressive image pays off when they do have a hand. Because it’s about attitude rather than cards, there’s a lot of variance to deal with. This means you’ll need to factor in a bankroll of 30 buy-ins or more (or 50 buy-ins for six-handed games at $5/10). In this type of game, it’s no good waiting for good hands to come along. Instead, you’ll see players raising and re-raising before the flop all the time, often with pretty dubious hands. Suited connectors, face cards and medium pairs are all good for a re-raise (useful if you get aces or kings later). You can also call to mix things up a bit, but generally, this is no time for limping. If you’re going to play a hand, raise three to four times the big blind (five times if someone’s already raised). Hopefully this will win you the blinds. If not, you’ve got the momentum you need to continuation bet, which should always be the next step in your plan. If you find yourself on the receiving end of this kind of tactic when you’re in the blinds, don’t take it personally. At this point, it’s purely about position. They’ve got it – they’re using it. You would do the same. One thing you shouldn’t do is play back just because you’re annoyed. The chance of getting caught out is so high that you’ll want to tighten up your play and focus on damage limitation instead. It’s possible to see off an aggressive blind-stealer, but only if you know what you’re doing, and who you’re up against. In this case, drawing hands with potential are your best friends. Hands like 4-5, 6-5 and 7-6 suited are worth a call. Because the payoff is small, this is one of the few times where a pre-flop call out of position is better than a re-raise. If your hand’s disguised well, your implied odds should warrant a call. The other hands you would call with are small pocket pairs from 2-2 through to 6-6 (unless you want to find yourself continuation betting into a K-10-8 board with 3-3). In general you should be thinking no set, no bet out of position – and always check the implied odds. If your opponent has $80 and raises you to $8 pre-flop, only call with 3-3 if he’s the type of player to pay you off. You might also want to apply the ‘rule of 10’ – and adjust the odds of flopping a set (7.5:1), to 10:1 – to cover set over set situations and the fact you’re out of position. Ultimately, calling out of position in this type of game is never going to be ideal. Sometimes, it’s better just to hold onto your chips and fold. In higher limit games (even big, more anonymous ones) predictable play is the road to ruin. So post-flop strategy becomes a lot about mixing it up and creating the kind of table image that will pay off later. For example, you’ll see people veering away from the standard continuation bet and floating (calling with a weak hand in position hoping to take the pot away later), bluff-raising or smooth-calling with any made hand. To deal with this, you’ll need to mix in some check-raises and check-folds yourself to keep people off-guard. You should also float more against anyone who tends to fold under pressure on the turn. If someone’s being particularly gung-ho, you should aim to bluff against them on the turn a decent percentage of the time (especially when the board changes or you pick up outs). You should also place a few all-in bluffs on the river to balance out the times you value bet a big hand. If the pot is $15 pre-flop, lead out for the full pot with any two cards (you’ll want a reasonably dry board – one high card and two cards are ideal). Why? It shows strength, it’s not a move you see often, and in terms of risk-versus-reward from the big blind, it’s a good one. Check-raise any flop with a single king, queen or jack. Since most hands miss most flops, they’ll need this face card in order to call. If you can play aggressively on all streets with the right kind of frequency, you’ll do well. These games are about the players more than the cards, so you need to be able to read them – without letting them read you. Get all the latest MLB News and updates on your social media outlets.